The Schönbrunn Map from city-walks should help you to prepare your visit at the palace and the gardens. To ensure a useful overview the map is clearly laid out and created at a scale of around 1:7000. The top 10 targets are marked with a star. For each of these attractions there is a photo listed with an assignment. 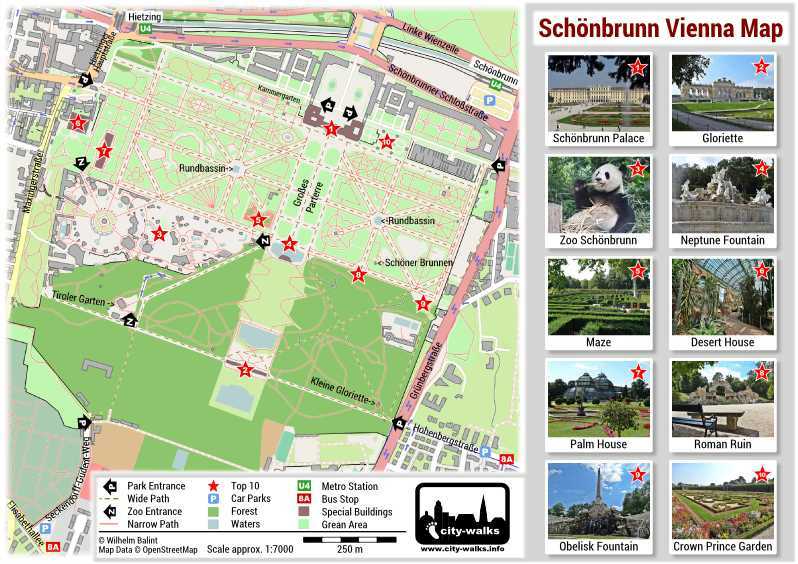 Please click on the picture of the Schönbrunn Map to open the PDF file! For arrival planning to Schönbrunn the metro stops of line U4 and the bus stops of line 8A are marked with symbols. Furthermore, you will find a few parking possibilities and the respective entrances to the palace gardens and the zoo. The majority of the paths in the gardens is unpaved, but well maintained. The main routes, which are usually set up quite generous, are marked according to the legend. The map is designed as PDF file in A4 format and it is available for download free of charge.